This article was originally written by Al Churchill for the Calais Advertiser in 2009. Football season is again upon us. A couple of years ago all the talk was about Tom Brady: Will his knee hold up? Will the cheap shot artists in the league try to put a helmet on it? But today, instead of Tom Brady, the Silverados are the talk of the town. Everyone’s excited about this year’s prospects for this team of Calais and Woodland boys, especially after their success last year. Win or lose, it’s nice to see the community get behind the team which some people describe, incorrectly, as Calais’s first football team. Understandably folks don’t remember any other Calais football teams but we’ve had them. It was just a very long time ago. The Calais Academy Football Team of 1903-04. 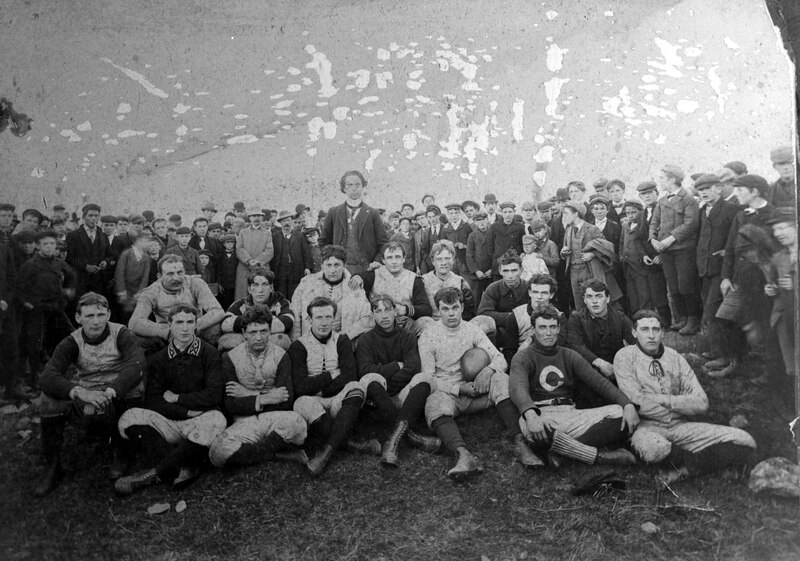 Football came to the St. Croix Valley in the late 1800’s. 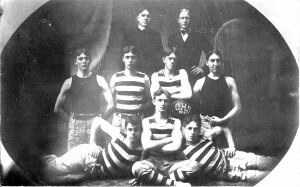 The historical society has photos of local teams dating back to 1898 but the game was popular here even earlier. All the local schools including Calais Academy had teams. There were also a large number of “club” teams in these days before compulsory education when most young men went to work rather than to high school. Club teams from Milltown NB, St. Stephen, Calais and Milltown, Maine squared off against each other and played the high school teams. A 1901 article reports on a game between Calais Academy and the local “club” team won by the Academy 5-0. Touchdowns were awarded five points in those days. Like the Silverados today these teams had big followings and often attracted large crowds. After 1900 Calais Academy began to play a more regular schedule of other high school teams. 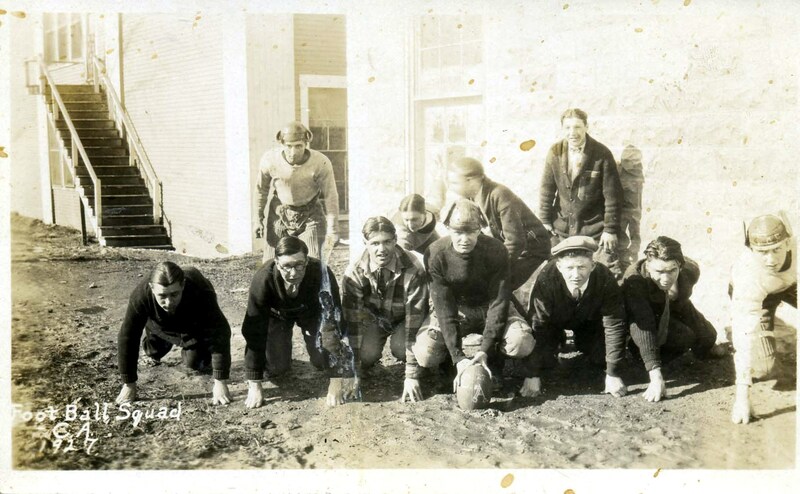 In 1901 the Calais team lost to Ellsworth 11-5 at Ellsworth and traveled to Old Town where they won 37-14, a very high score for football in the days before the forward pass became legal. These road games were made possible by the railroad, which came to Calais in the late 1800’s and offered relatively cheap and dependable service. It helped that the players all played both ways and had little in the way of equipment to transport. The 1901 team had 12 players and wore no pads. Helmets of flimsy cloth and leather served mainly to keep the head warm. According to historian Ned Lamb the original Calais Academy uniforms were women’s long stockings worn under homemade canvas pants. The first decade of the 20th century appears to have been the heyday of Calais football. Many photos of the teams from this decade exist as do reports of games in the papers. Club teams were also active: a 1902 article reports the Calais Dirigos winning 10-0 over an Ellsworth team which came shorthanded to Calais and recruited a few boys from Milltown NB to fill their squad. The game report describes a bruising battle at the line of scrimmage with the quarterback doing little other than handing off to one of his three running backs, usually the left half back, McCatherine, or lateraling to his left end, Smith who was also the team’s kicker. Smith missed both extra points. A late 1800s football or rugby club team from Calais. Calais football continued through the 1920’s although the reports in the yearbook are sparse. It finally died out completely during the Depression. 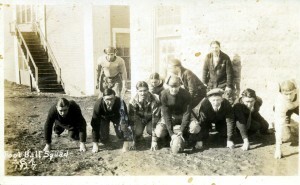 The last Broadcast which describes a football season at the school was 1932. In seven games, Calais was shut out 4 times and shut out the opposition 4 times, scoring a total of 27 points in the seven games. For those trying to do the math I’ll give you a hint, they played to a scoreless tie with Machias, won every game in which they scored and lost every game in which they were scored on. Their record was 3-3-1, beating Vanceboro, St. Stephen and Milltown NB. They lost twice to Lubec by big margins and once to Vanceboro. 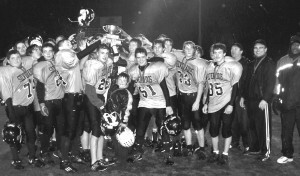 Thus ended the last reported season of Calais football until the arrival of the Silverados. 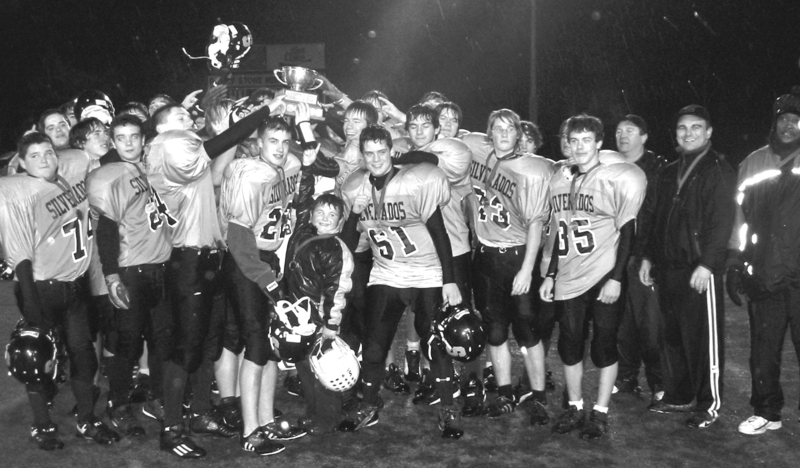 It has been 75 years between teams but the Silverados have` been worth the wait.